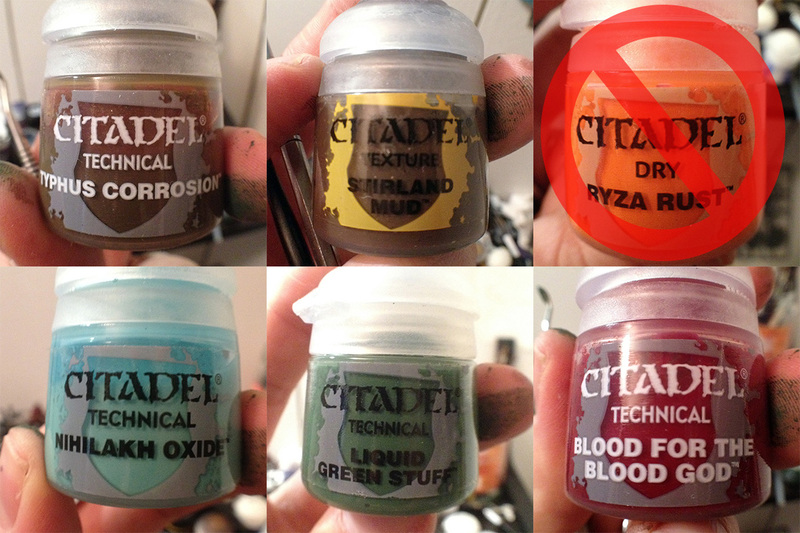 One of the first things I noticed is that Ryza Rust is NOT a technical paint though it is marketed along side the other paints. I guess that this is because it is commonly used along side these technical paints. I did not read the pot too carefully and had to scratch all paint from a shield I tried this “technic”. Ryza Rust is a Dry paint which means it is brushed over the desired are or it can be used to lightly brushed to desired places. I’m not sure if this is any better than using a basic orange colour. Typhos Corrosion was the first from these paints I tried out. I was not too excited when I first saw the outcome. It gives a light and translucent brown layer on the surface. But when it dries the effect is actually quite good. 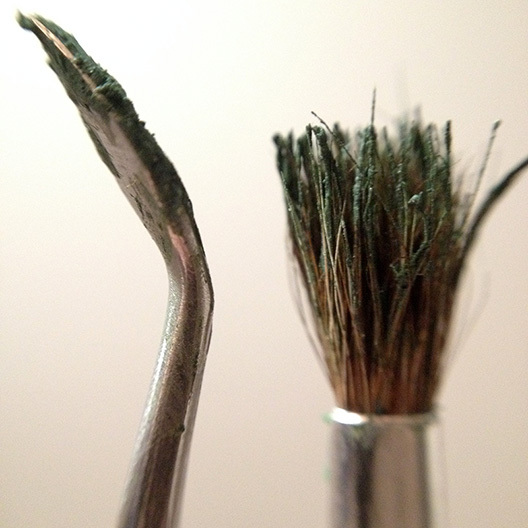 The paint also leaves little spots and grain thus giving the effect a corroded look as intended. 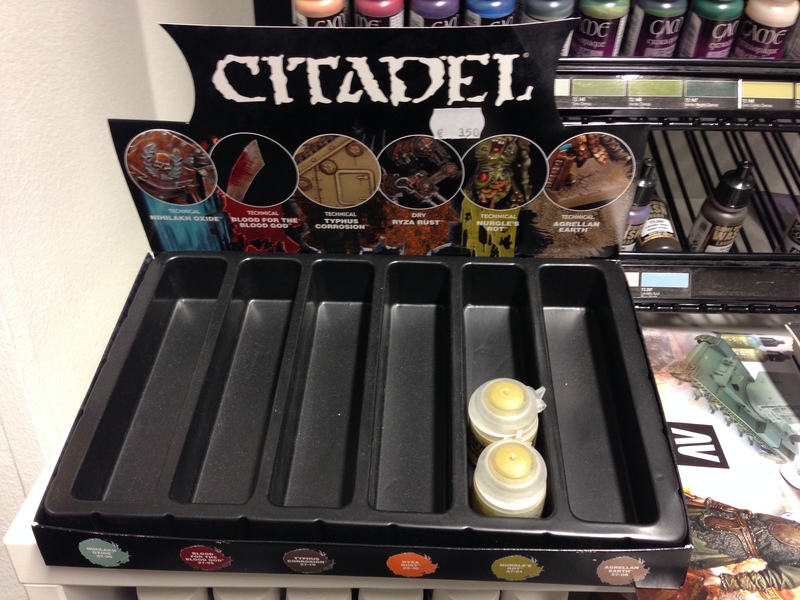 For a Chaos Marines army for Warhammer 40.000 this paint would surely come handy. Nihilakh Oxide is a good pair for Typhos Corrosion. It acts almost like a Shade paint pooling into recesses but it is not nearly as translucent. This paint will leave a good, strong colour and as such it cannot simply be painted all over. You have to decide into which areas you wish to use it. As can be seen in the shield on the right these two paints can do marvels together if you are painting an army of Vampire Counts for example. I consider the Blood for the Blood God as something of a cursed paint. It is like the ultimate fix for a gore painter. The effect looks so good that you simply have to use it in any place you can. And then some. This paint was not actually something I planed on using after a quick test. But I ended up using it on all of my beastmen. The effect is simply stunning. The paint creates a thin layer of watery blood. Original colours shine through a bit and after the paint dries it is a bit glossy as it had been spilled just recently. I have used a lot of techniques presented in the Ogre Kingdoms armybook (for example) but this paint simply outshines them in most ways and it too simple to use. Stirland Mud was another winner for me. It is a brown paint that when painted dries into a muddy clumps. This saves my the time needed to glue the sand and paint it brown. 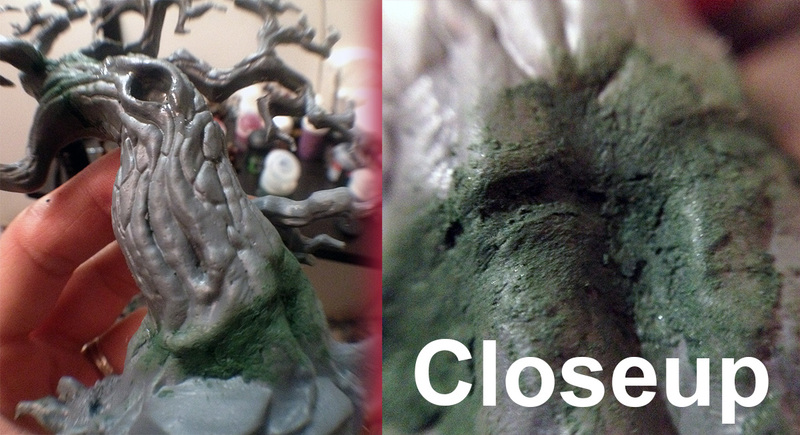 I can just use this mud to add the texture and the colour into the base. I have dry brushed it but I see no reason why you could not leave it as it is for rank-and-file soldiers at the back ranks. It looks good in any case. Last technical I tried was the Liquid Green Stuff. Having used regular Green Stuff and various kinds of Milliputs I think that this technical is something I always wanted. Due its consistence it is easy to use to fix the gaps caused by mould lines. It seems to retract a bit while drying so I ended up needing to add a couple of layers of it to close the larger gaps. I doubt it can be used to create something new (like mail shirt or pouches) as easily as a regular piece of Green Stuff but it certainly speeds up the assembly of miniatures. You just need right tools to do the job. My fingers where all green after working on this even though I used a brush (regular, cheap one) and some kind of carving tool. 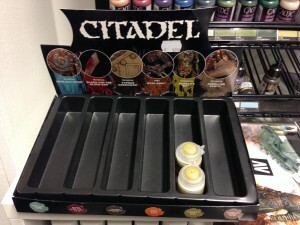 This entry was posted in Miniature Gaming, Reviews and tagged Games Workshop, Green Stuff, miniatures, painting, Paints, Review, Technical paints by Lauri Maijala. Bookmark the permalink.